NOTE: This is for PICK UP only. Please email, call or text 204-453-7788 for address and instructions. Each BBBB (Big Backyard Burner Bag) holds more vs. a gas station bag. 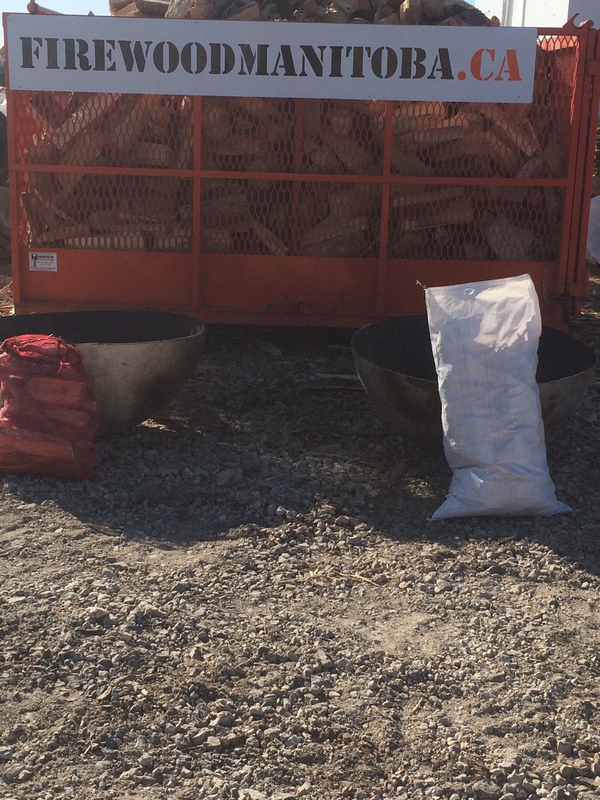 2 cubic foot big bags of guaranteed seasoned firewood. Cut and split firewood only. No 2×4s pallets, nails, painted wood etc. Includes heavy duty nylon bag you can re-use vs. thin plastic bags. Pickup from our location in St. Boniface. 10 minutes after starting the fire…. Ready to go for the September Long and beyond, camping or anywhere you need firewood…Big Backyard Burner Bags Original (all cut and split firewood). Please note, this firewood is all cut and split traditional firewood. All dry, all ready to burn with little or no smoke…cut and split pieces = long burn time and more heat vs. our BBBB 2.0, now that the weather is cooling off that extra heat is appreciated. 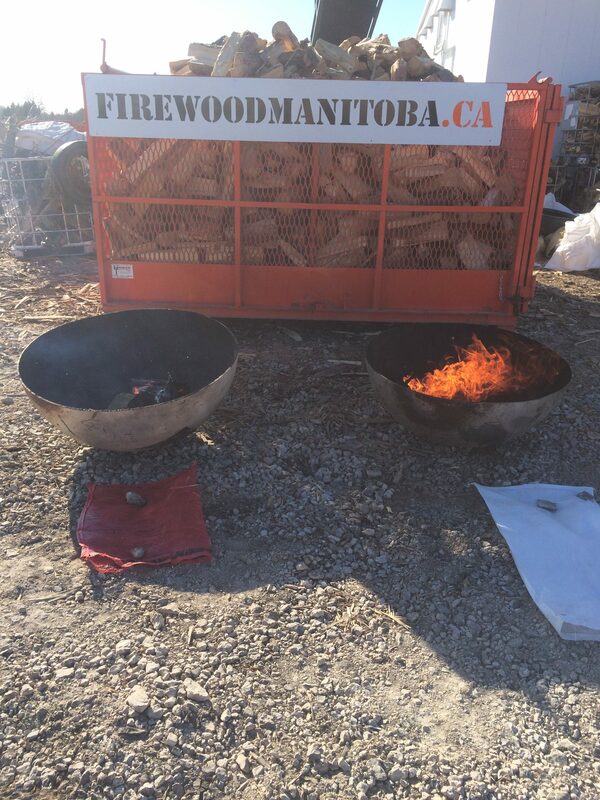 We take guaranteed seasoned cut and split firewood from our firewood supply company, fill our BBBB’s with them and make them available to the public. Since the wood is guaranteed seasoned (if you find a piece that’s not dry your whole order is free) you’ll have a fire that’s easier to start, burns hotter and with little or no smoke to bother neighbours or those that want to enjoy a fire but not smell like smoke after. We’re open all week and weekend including all day Friday, Saturday, Sunday and holiday Monday to help with your firewood needs. Open 8 am to 8 pm. Need a fire? People coming over? Just want to relax in front of a warm glow but don’t need a lot of firewood or don’t have the room to store it? 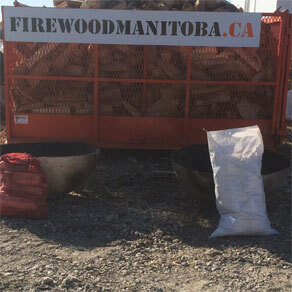 Firewood Manitoba has their amazing mobile firewood vending machine setup in St. Boniface for wholesale firewood supply. Just in time for firepit season…or cooking….or heating….or whatever. 2 cubic foot big bags of guaranteed seasoned firewood (about 2x the size of gas station bags)…$15 / Big Bag, or buy 3 bags for $40 and save. – Guaranteed dry, if you find a piece that isn’t dry your whole order is free…and since it’s seasoned there will little or no smoke. Dry wood = easier to start fires as well, we use 1 page of newspaper to start our BBBB’s…try that with a gas station bag. – Firewood only. No 2×4’s, pallet wood, nails, painted wood etc. – Perfect for condos, town houses, the occasional backyard fire, roasting wienies, squirrels (if you’re into that) etc. 2.) Give us a call (204-453-7788) for directions to our St. Boniface location….you can also text. Mention this ad and get 3 BBBB’s for $40……. 1.) You decide you need firewood and place your order. 2.) Give us a call (or text) (204-453-7788) for directions to our St. Boniface location. 3.) 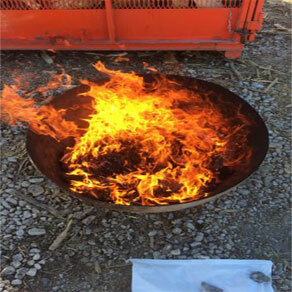 You visit our site and start loading your Big Backyard Burner Bag with guaranteed seasoned firewood. 4.) You're set for firewood. This order is for PICK-UP ONLY. Need more than 3 BBBB's? We deliver 1/4, 1/2 and full cords of guaranteed seasoned firewood too.